completion of the JRCPTB requirements for stage of training which can be found via; ARCP decision aid and the guidance on WPBAs. In line with national guidance it is likely that the ARCP process will become stricter and therefore it is important to spread your WPBAs throughout the year as if they are clustered towards the end of the year it may result in an unsatisfactory ARCP outcome. Finally congratulations to our colleague, Dr Ben Wiles on winning the best case presentation in the EHRA Young EP Clinical cases session - I was not there but I hear that his presentation was excellent even if he did ask Dr Brugada to join him on a business venture! Rob and Simon are kindly in the process of arranging an evening event for the 17th of May in Romsey where they will talk on DFT optimisation and the cardioMEMs system. In order to gauge interest please could you email Rob if you are interested. 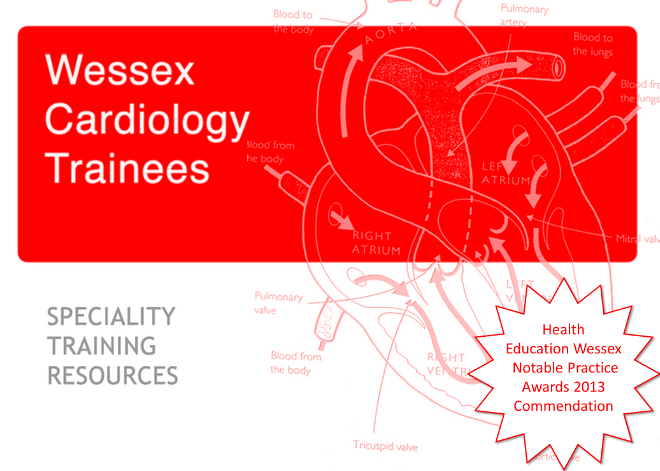 Just a quick reminder that the cardiovascular imaging training day is this Monday (26th March). It will be held at the Heartbeat center at Southampton. It looks like an interesting program focusing on the use of CT. The start time is 1000 and you can see the program here. There is no need to pre-register to attend this training day. Just a quick reminder that the next training day is the 26th of March on cardiovascular imaging - further details to follow shortly. Also the next evening event will be on the 2nd of May at the Chesil Rectory - this meeting is being organised by Ellie from Bayer and will have an educational talk on ACS and antithrombotic therapy. Click here for a provisional program and please email Ellie Draper to sign up - Spaces are limited and will be allocated on a first come first served basis!